The MAV will be a VTOL vehicle capable of pinpoint landing on Mars, refilling with propellant from local Martian resources, and returning the crew of six astronauts to Mars orbit. Instead of bringing H2 or CH4 from Earth, the MAV will use H2O obtained from the Martian surface in addition to CO2 from the atmosphere to manufacture 100% of the required ascent propellant. 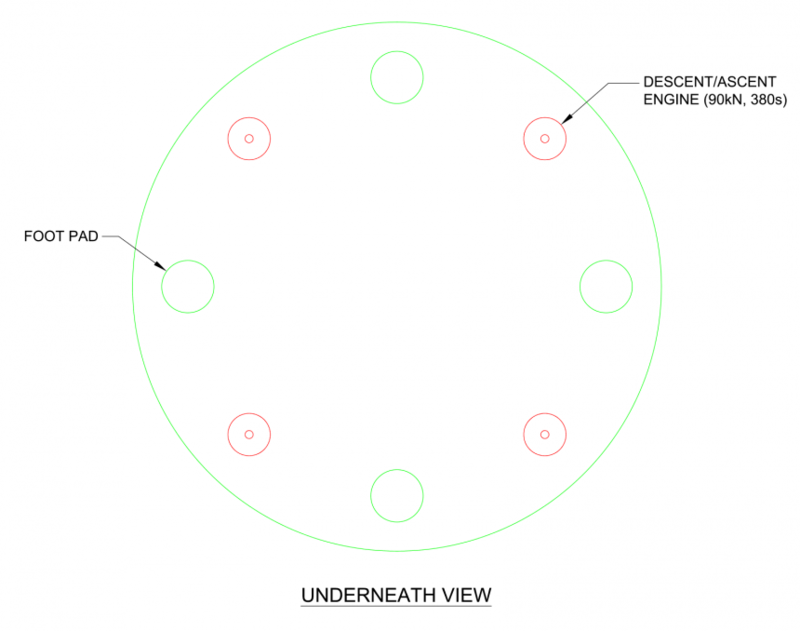 This strategy should lighten the landed vehicle to the extent that a common stage can be used for both descent and ascent, thus further reducing the MAV’s mass, making it far cheaper and easier to deliver to Mars. Nanostructured materials, composite cryotanks and other innovations are incorporated into the design to reduce the vehicle’s mass as much as possible, to the point where the necessary power for manufacturing ascent propellant can be provided by solar energy rather than nuclear, thus reducing complexity as well as negative environmental effects. The MAV concept presented in this section is somewhat different than others that have been presented in the past, being lighter, simpler, more technologically ambitious, and possibly cheaper. Drawings included in this section are simple and intended only to help illustrate some basic design concepts for the MAV. Complexities of the ISPP subsystems, propellant pumps, thermal control systems, avionics, etc. are not shown. Also known as the “Mars Ascent Capsule”, the modified Dragon capsule at the apex of the vehicle is empty during descent, but during ascent to Mars orbit will contain six crew plus their marssuits and areological samples. Because it doesn’t need to land or re-enter an atmosphere, Kepler will be fabricated without a heat shield, landing legs, or SuperDraco engines and associated tankage. It will, however, retain its RCS/OMS and the smaller Draco engines, as these are necessary for docking with Adeona after ascent. 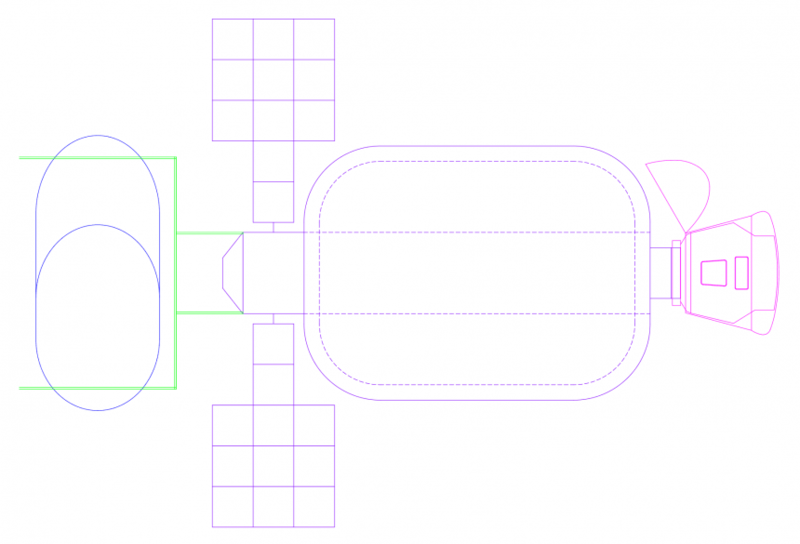 The trunk section normally connected to a Dragon capsule could potentially be included in the MAV and used to contain solar panels, which would help to supply power to the MAV for ISPP, in addition to powering the Dragon’s systems while in Mars orbit. Another use for it could be to carry samples. However, the trunk would add significant ascent mass, and is best eliminated. 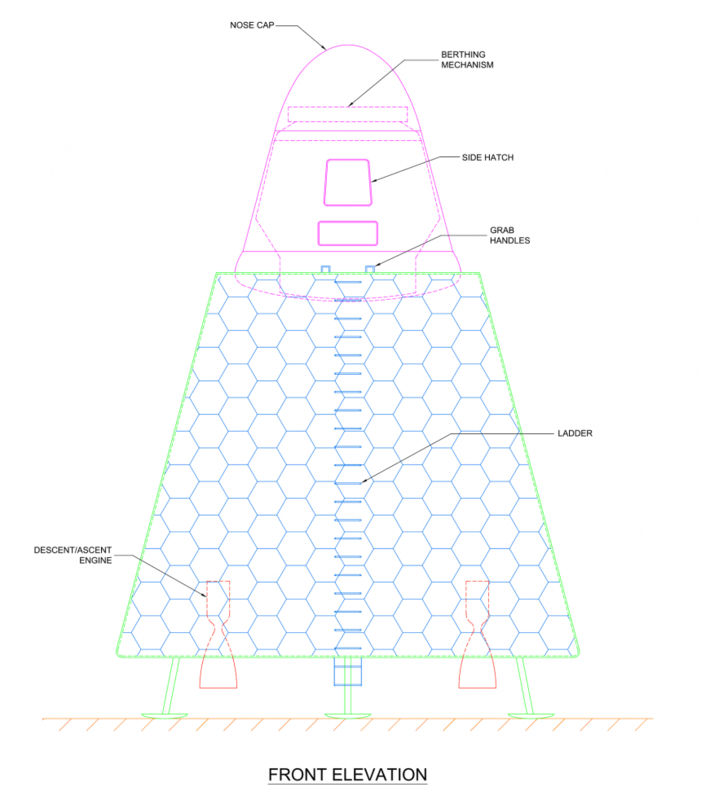 Solar energy can be provided by the MAV’s PV coating and/or PV blanket, and since Kepler only needs to carry six astronauts instead of the usual seven for which it is designed, the lower centre seat can be replaced with a storage area for samples. This may mean fewer samples, but the total sample mass is limited anyway due to mass constraints of the payload; plus, the samples can be returned to Earth with the crew at the end of the mission more easily if Newton is similarly configured. The lower section of the MAV is currently envisaged to be a frustum of a cone, and manufactured from a high-performance aerospace material such as an aluminium-lithium or titanium alloy, or titanium-carbon composite. 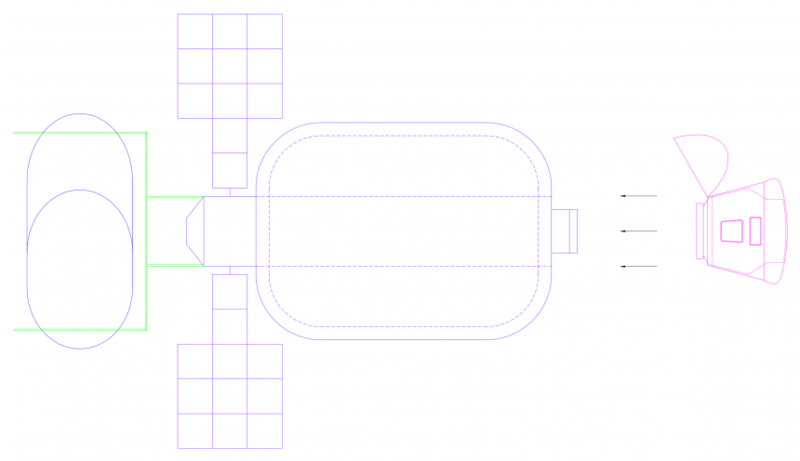 Compared with the vertical cylinder design typical of rockets, the conic shape lowers the centre of gravity of the vehicle and provides a wider base, which will increase stability should the MAV land on uneven terrain. One of the reasons for the ERV’s nuclear reactor in the Mars Direct architecture is that propellant production can proceed quickly, day and night, in order to minimise hydrogen boil-off and ensure that all the propellant gets made. However, by using local water as a hydrogen source, the hydrogen is immediately converted to methane and does not need to be stored. Thus, there will be no boil-off and less urgency to manufacture the propellant as quickly as possible. A constant power supply is therefore not a strict requirement for ISPP. Solar energy could be used, and propellant manufactured only during the daytime when power is available. There are about 20 months between when the MAV arrives at Mars and when the crew leaves Earth at the subsequent launch opportunity. Even if propellant is only being made during the day, this should still be plenty of time to ensure that the MAV is full of propellant before the crew leave Earth. In fact, there is about 44 months between the MAV’s arrival and departure (26 between its arrival and the arrival of the crew, plus 18 months of surface mission), so extra time is available if required. By using solar panels instead of a nuclear fission reactor for ISPP power, the mass of the reactor, robotic truck and electrical cable that would connect the reactor to the MAV, are eliminated, as is any risk of an unshielded reactor irradiating the MAV, the crew, and the pristine and scientifically-valuable Martian environment. 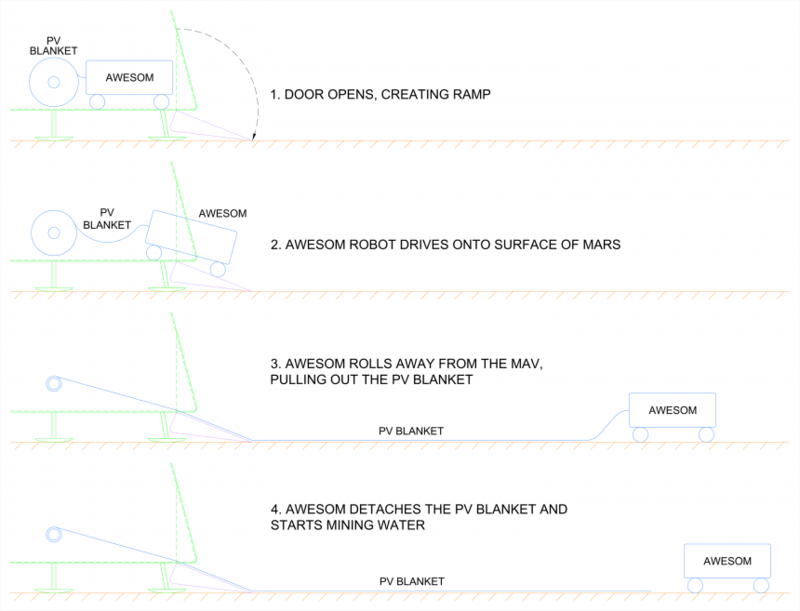 One approach for providing power for ISPP could be via a roll of solar fabric (the “PV blanket”) stored in the lower section of the MAV, on a fixed roller, which the AWESOM robot can unroll on arrival simply by dragging one end away from the MAV. Another method for supplementing MAV power is for the outer surface to be coated in organic photovoltaic paint, such as that being developed by NanoFlex Power Corporation and the University of Newcastle. Yet another idea would be for the outer walls of the MAV to open up like a flower, revealing solar panels on their inner surfaces. In the event that photovoltaics cannot produce sufficient power to manufacture the necessary propellant in the given time frame, a possible supplementary power source would be an ASRG. This would generate heat in addition to electricity, which could help maintain the Sabatier reactor at its required operating temperature of around 300-400 °C, and to keep the electronics warm. In fact, an ASRG may even be preferable to the photovoltaic blanket, which would cover useful ice-containing ground, and could interfere with operation of the AWESOM robot. If radioactivity is a concern, the ASRG can be removed along with the ISPP modules before launch of the MAV, and buried using the CAMPER’s excavator attachment. Several types of methalox rocket engines have been proposed and developed, however, none are currently in active use. One possible candidate for MAV engines could be the XR-5M15 developed by XCOR, which provides about 33.4 kN of thrust and weighs about 48 kg. At least six would be required for Mars ascent, giving a total thrust of about 200 kN and a total mass of about 286 kg. However, even with six of these engines the acceleration would be rather low and the engines would need to burn for a long period to reach orbit. More could be used, but four engines work better for the geometry of the MAV, and larger engines typically provide a superior TWR. The only other methalox engines in development are either too small or too large. Therefore, although it will incur some development costs, it will probably be necessary to develop another new methalox engine. The engines, which will be used for both descent and ascent, are estimated to have a thrust of approximately 90 kN and Isp of approximately 380 s. These figures are similar to the engines described in the DRA, which have an average thrust of approximately 22,000 lbf (88,964 N) and Isp of approximately 369 s. The higher Isp is likely to be achievable for a newly-developed methalox engine incorporating the latest materials and manufacturing techniques. A pump to collect atmosphere. A bed of zeolite 3A to absorb water from the atmosphere. A condenser to separate CO2 from the dried air. A roll of photovoltaic material to provide power. The AWESOM robot to collect water from the surrounding terrain. An electrolysis unit to separate water into H2 and O2. A Sabatier reaction chamber to react H2 and CO2 to produce CH4 and H2O. A heater to provide heat to the Sabatier reaction chamber, water tank and electronics. Additional elements as necessary for separation of gases, etc. These components and their operation are discussed further in the section on In Situ Propellant Production. In the drawings below, the modules are shown as neat rectangular units. This is really just concept art. The individual components of the ISPP system will be quite varied and complex in their actual designs. 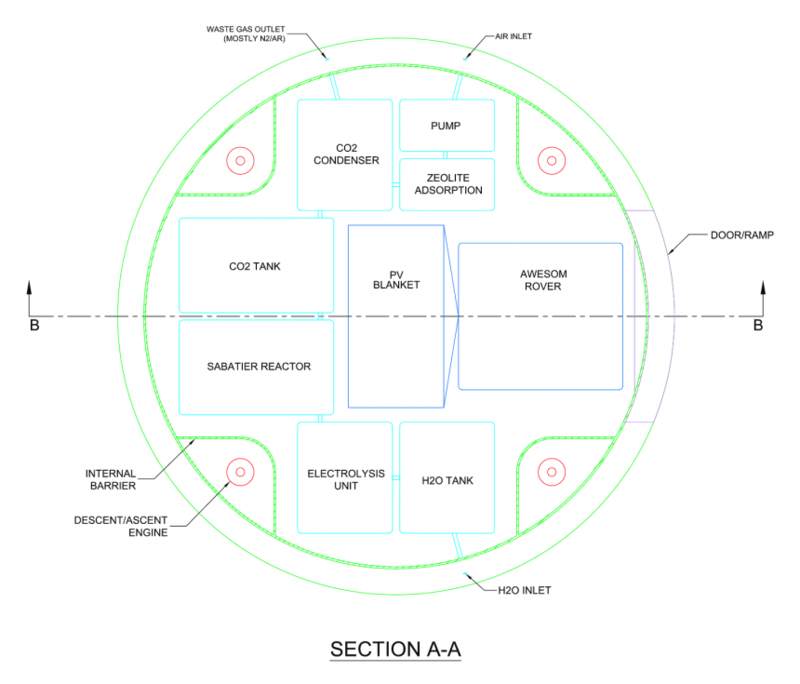 The same basic design concept of nested composite cryotanks as used in Adeona will also work for the MAV. The MAV avionics include a sophisticated GNC system based on LION or a similar technology, which will be capable of pinpoint landing on Mars by visual identification of landmarks. 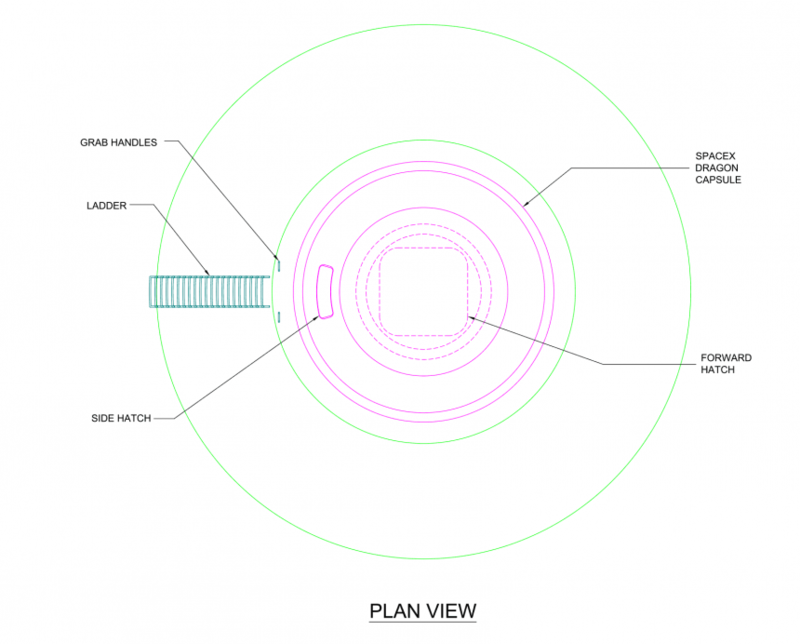 The MAV will have cameras in its base, sides and attached to the capsule. The reference EDL architecture that was ultimately selected for this study was a hypersonic aeroassist entry system, with a mid lift-to-drag ratio (L/D) aeroshell that was ejected at low supersonic Mach numbers. An LOX/LCH4-fuelled propulsion system was used for deorbit delta-V maneuvers, RCS control during the entry phase, and final terminal descent to the surface. Thus, the DRA proposes aerobraking plus methalox propulsion for landing large items on Mars. This approach is retained in Blue Dragon. Because ascent propellant is being made on Mars, and both descent and ascent propulsion systems are based on methalox, it should be possible to use a single stage for both ascent and descent. If so, this will reduce the complexity and mass of the overall vehicle, making it simpler to land on Mars while not significantly increasing ascent mass. The usual reason for having separate stages for descent and ascent is to improve the efficiency of ascent. A spacecraft is typically heavier during descent because it carries at least some of the ascent propellant, plus its payload. By leaving behind the payload plus any superfluous engines, tankage and superstructure required only for descent, the ascent mass can be minimised and thus far less propellant is required for ascent (which means less mass needs to be landed on Mars, which is easier and cheaper). For example, the descent stage of the Apollo Lunar Excursion Module included engines and propellant tanks in addition to equipment such as tools and experiments to support surface activities — essentially everything that was not needed for ascent. Leaving this hardware behind enabled the ascent mass to be much lighter. In Mars Direct, the ERV is landed with 6 tonnes of H2. In the DRA, the MAV is landed with about 6.5 tonnes of CH4 or 2 tonnes of H2. Delivering this mass to Mars has a significant impact on EDL system design, and the initial size of the vehicle. With these architectures it makes sense to have a separate descent and ascent stage, because the descent vehicle needs to be much larger and more powerful than the ascent vehicle needs to be. In Blue Dragon, however, the MAV lands with empty tanks, because all the ascent propellant is manufactured on Mars (see In Situ Propellant Production). The MAV will also not be carrying any experiments or items of equipment for use by the crew, as these will be delivered in the SHAB and cargo capsules. Kepler will be empty, so the only “payload” will be the ISPP and ISWP systems, i.e. the hardware for production of energy, water and propellant, which should mass about a tonne or two at most. The descent vehicle therefore does not really need to be significantly bigger or more powerful than the ascent vehicle. This reduces any efficiency gains that could be obtained by having separate descent and ascent stages, to the point where it could be more efficient to simply have a single stage for both descent and ascent. The MAV would thus descend and ascend using the same propellant tanks and engines. In order to reduce the ascent mass and thus the quantity of propellant that needs to be manufactured, the ISPP subsystems can all be removed prior to launch. The PV blanket is pulled out by the AWESOM robot on arrival, so these components are already removed. Even if a small nuclear reactor is used for MAV power as described in Mars Direct, this, too, will have already been removed from the MAV, having been relocated via a small robotic truck. The ISPP hardware can be designed as modular units that the crew can easily unbolt from the MAV and leave behind on the surface of Mars. They may even wish to do this on arrival if the MAV’s propellant tanks are already full at that point. The ISPP modules, AWESOM robot and PV blanket could be moved to the SHAB and used to make propellant for the CAMPER or a generator, and to provide the SHAB with additional energy. With these items removed from the MAV, the only surplus ascent weight is a slight excess of superstructure, i.e. the “container” in the lower part of the vehicle where those items were originally located. The mass of this lower section can be reduced via removable panels, which would provide access to the internal modules so they can be extracted. A single descent-ascent stage will make the whole vehicle simpler, lighter, cheaper, easier to launch from Earth, and, most importantly, much easier to land on Mars. The landed mass of the MAV in the DRA is comprised of the descent and ascent stages, all ISPP hardware, and the methane component of the ascent propellant, for a total landed mass of at least 20-30 tonnes. 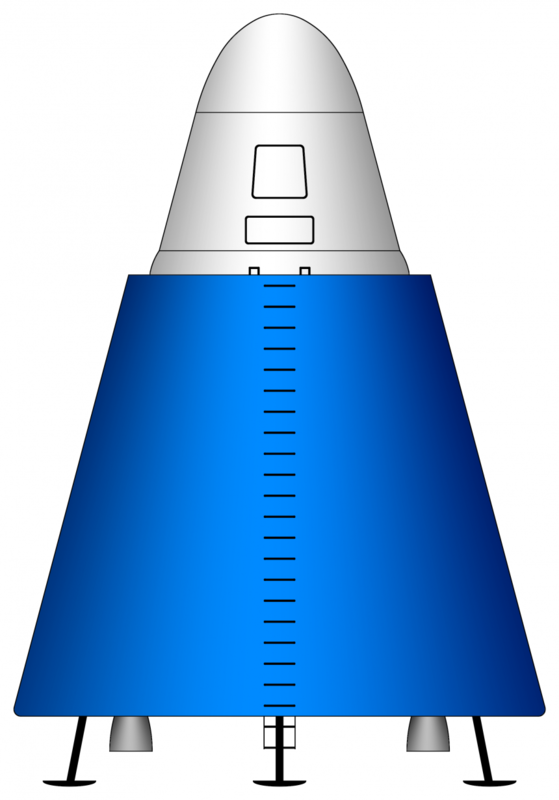 However, the MAV in the IMRS plan, with its common descent-ascent stage and zero propellant, lands weighing only around 10 tonnes. 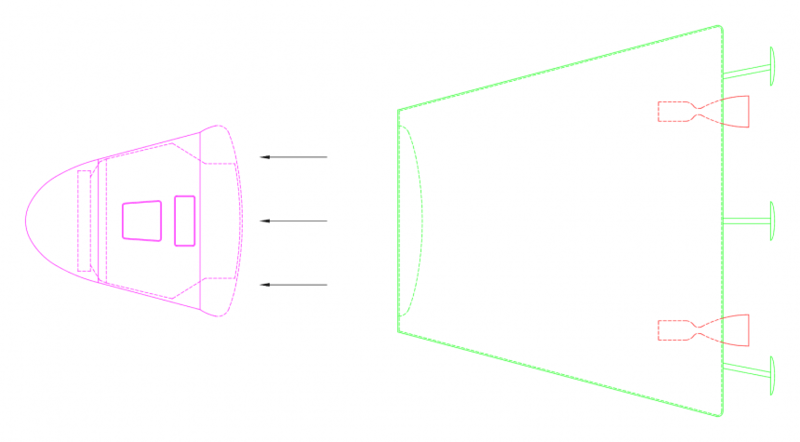 Because the same propellant tanks are used for both descent and ascent, for optimal efficiency the propellant requirement for descent will be less than or equal to that required for ascent. This should be possible, because with this design the descent and ascent masses are very similar. Although the ISPP and ISWP hardware are included in the descent mass but not the ascent mass, the crew plus their marssuits, kit bags and areological samples, are part of the ascent mass but not the descent mass. In other words, the descent and ascent payloads balance out. The MAV approaches Mars via direct entry, which will requires a ∆v of about 6.5 km/s to land. This is somewhat higher than the 5.6 km/s ∆v required for ascent, since the MAV must only reach Mars orbit on ascent. However, the descent propellant requirement is reduced through the use of aerobraking. 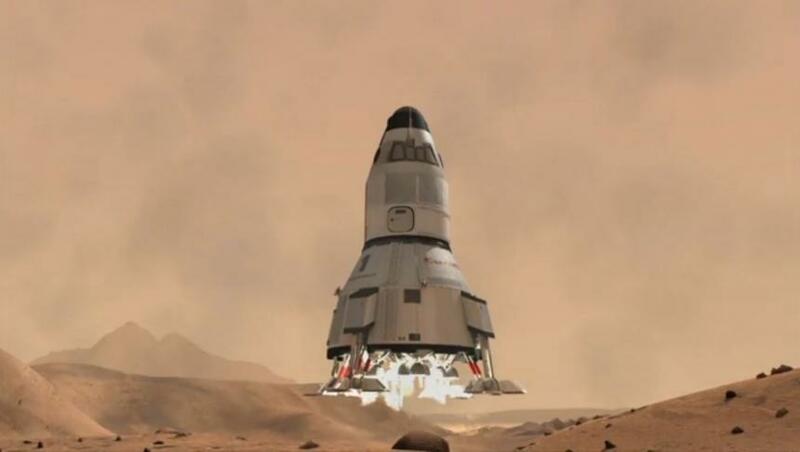 The following frames extracted from the legendary documentary “The Mars Underground” help to illustrate a possible EDL system for the MAV (although the MAV in the images is somewhat different from the proposed concept). In the movie, the MAV uses three large parachutes to help slow its descent. However, in the DRA, as mentioned, the MAV descent is entirely propulsive, which is probably a good idea. Parachutes are extremely difficult to test, they add considerable complexity to the EDL system, and can only do so much in the thin Martian air. They could also cause the MAV to be blown off course by wind, which would interfere with the goal of accurately landing the MAV at a specific location. The MAV approaches Mars directly from the inbound MTO, and is therefore travelling at high velocity when it hits the atmosphere. Aerobraking is used to slow its descent, converting velocity into heat via friction. At this point its propellant tanks are full. The MAV is protected by its aeroshell, which also helps to slow it down. Inflatable aeroshells, much lighter than the metal one shown in this image, are actively being developed by NASA. The most recent was tested in an experiment referred to as “IRVE-3”, or “Inflatable Reentry Vehicle Experiment”. The process of aerobraking slows the MAV until its rate of descent is low enough that it can land propulsively with the available propellant. When the MAV’s speed has reduced sufficiently, the aeroshell is jettisoned. Sensors and cameras on the underside of the MAV, in combination with signals from MCOS, enable the onboard software to coordinate an accurate landing. The final stage of EDL is fully propulsive, using the four methalox descent/ascent engines and consuming virtually all of the propellant. 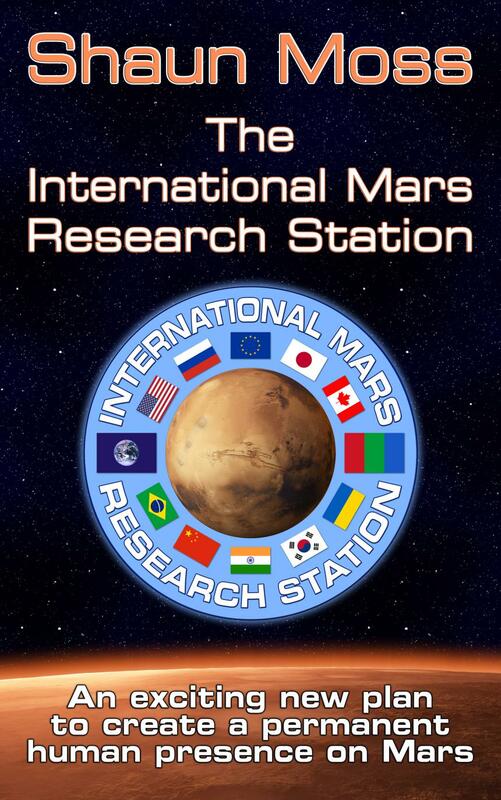 ISPP refers to the manufacture of methalox propellant from indigenous Martian resources. It is arguably one of the most important applications of ISRU ever proposed, because it enables astronauts to return to Earth from Mars using present-day technology. Launching from the surface of Mars has been cited as one of the biggest obstacles when it comes to HMMs. It is for this reason that the plan for Mars One is to send people to Mars one-way, thus side-stepping this difficulty. Launching from Mars is difficult is because of the large mass required. An estimated minimum wet mass (vehicle plus propellant) of 30-40 tonnes would be necessary to lift a crew of six humans from the surface of Mars to Mars orbit. Yet the heaviest object soft-landed on Mars to date is the Curiosity rover, which weighed just 900 kg. Using the new SHLLVs such as the SLS it should be possible to land payloads of up 20-30 tonnes on Mars. However, this may still not be enough for a MAV filled with propellant. To land larger payloads on Mars will require space vehicle technology yet to be developed. 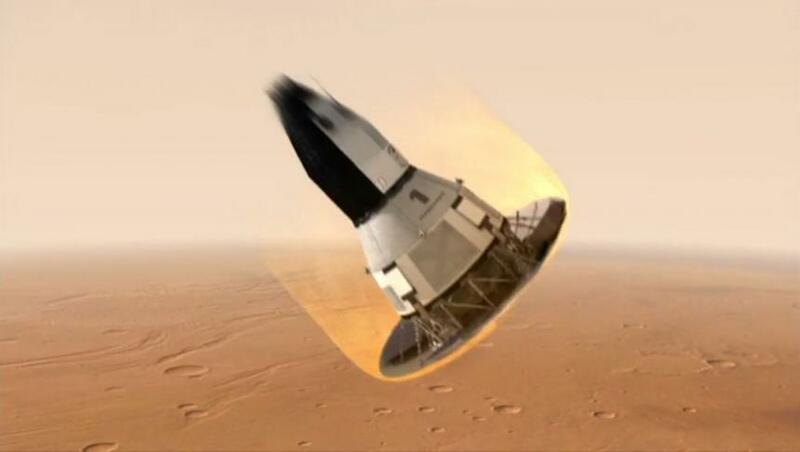 However, if the ascent propellant can be made on Mars, a MAV can be landed on Mars empty of propellant. This makes the landed mass significantly less, which means it can be done sooner. This is why the idea of ISPP was developed. When Mars Direct was developed by Dr Robert Zubrin and David Baker at Martin Marietta during the 1990s they described the benefits of landing an ERV on Mars carrying only a fraction of its ascent propellant, and obtaining the remainder from resources available in the atmosphere. In Mars Direct, about 6 tonnes of H2 is brought from Earth. Hydrogen is the most difficult element in methalox propellant to obtain from Mars, being unavailable from the atmosphere in quantity. The H2 is reacted with CO2 extracted from the Martian atmosphere via the Sabatier reaction, producing CH4 and O2, which are liquified and stored cryogenically. Additional O2 is obtained from CO2 via RWGS (Reverse Water Gas Shift), which produces H2O that is then electrolysed to H2 and O2. A total of 108 tonnes of methalox are produced: 24 of CH4 plus 84 of O2. 96 tonnes are for Mars ascent, and 12 tonnes are for surface vehicles. The hydrogen transported to Mars represents just one eighteenth of the total propellant mass required (plus a margin to compensate for boil-off). Mars Direct showed that if the propellant for Mars ascent is manufactured at Mars in this way, the resulting mass saving could potentially reduce the cost of a human mission to Mars as much as a factor of eight. This single innovation brought the goal of a HMM from future-fantasy into near-term reality. Mars Direct gathered so much attention that the two engineers travelled the US presenting their plan and building renewed interest in sending humans to Mars. With feedback from NASA, Dr Zubrin modified the Mars Direct plan to create Mars Semi-Direct. This variation on the architecture used a Mars Ascent Vehicle instead of an Earth Return Vehicle, the difference being that the MAV only needs to reach Mars orbit, rather than travel all the way back to Earth. This significantly reduces the amount of ascent propellant required. Instead of 108 tonnes of methalox, only about 20-30 tonnes is needed. This reduces risk, propellant tank size and mass, energy requirements for the MAV, mass of the power system, the landed mass of the MAV, IMLEO and cost. No ISPP at all, i.e. all the CH4 and O2 required for ascent (about 30 tonnes) is brought from Earth. This option is the least risky, but the most expensive and difficult. About 6.5 tonnes of CH4 are brought from Earth and 23 tonnes of O2 are manufactured locally by reducing atmospheric CO2. This is a reasonable compromise, as the ISPP system would be very simple, and yet the descent mass would still be greatly reduced. About 2 tonnes of H2 are brought from Earth, and the methalox is manufactured via the Sabatier and RWGS reactions, as in Mars Direct. This option is technically more complex, but not overly so, and has already been demonstrated by Dr Zubrin and colleagues at Martin Marietta 21 years ago. None of the ascent propellant is brought from Earth; all is made on Mars. This fourth option is the most challenging, but is favoured in the IMRS plan. If methalox is made from H2 brought from Earth as in Mars Direct, insufficient O2 is produced for optimal combustion. That’s why, in Mars Direct, additional O2 is produced from CO2 using the RWGS reaction. By using local H2O instead of brought H2, electrolysis of the water produces more than enough O2, obviating the need for a RWGS subsystem. It develops an essential technological capability that will benefit all future human missions and settlements. Explorers and settlers need water for life support, cooking, cleaning, food production and other things, and hydrogen for manufacturing propellant and other valuable substances. Mars has an abundance of water, and learning how to obtain it is fundamental to settlement. It therefore saves time and money. Rather than investing in the knowledge and technology needed for transportation of hydrogen or methane to Mars, which would only be useful for a few missions, it will be more efficient to proceed directly to the development of knowledge and technology known to be required for long-term settlement, i.e. extraction of water and hydrogen, and propellant production, from local resources. It makes the descent mass of the MAV as light as possible, since the mass and volume of the ISPP system — even a more complex one that includes a mobile robot — is much less than the mass and volume of the propellant. This greatly reduces the difficulty involved in landing the MAV on Mars. As discussed, it may become possible for the MAV to have a common ascent/descent stage, further reducing its mass and greatly simplifying the design of the vehicle. 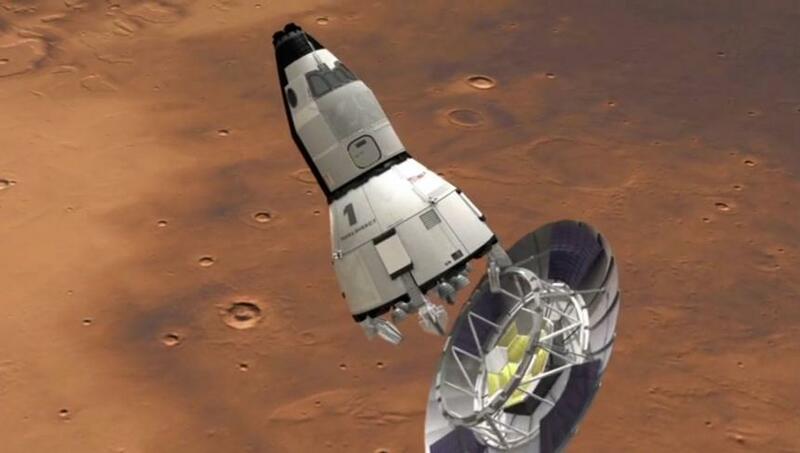 Previous architectures have opted to transport none or some of the propellant to Mars as a compromise because of the difficulty of obtaining hydrogen. However, this compromise creates less advantage than it would initially seem, since the reduced complexity of the ISPP system is largely offset by the increased complexity of the EDL and propulsion systems. In addition, it does not greatly reduce risk. Even though producing propellant for the MAV is in the critical path for the mission, there is never any risk of LOC or LOM (Loss Of Mission) because the crew will only depart Earth if ISPP has already worked as planned, and the MAV is filled with propellant and ready to go. If the ISPP technology does fail, the crew simply waits for a new MAV with a better ISPP subsystem to be built and sent to Mars. The only loss is a delay of the mission until the next launch opportunity, and the cost of ongoing development. Although this would be inconvenient, it is hardly a show-stopper, and much would be learned from the initial MAV/ISPP mission. With these things in mind, a superior strategy is clearly to embrace the more ambitious but significantly more rewarding goal of manufacturing 100% of the ascent propellant on Mars. Development of this capability is essential and inevitable, and there’s no benefit to postponement. A much greater ROI can be achieved by including this requirement from the outset. There’s no question that a collaboration of the world’s top space engineers, with access to 21st-century tools, can achieve this technological goal. Step 1: On arrival at Mars, a door opens in the base of the MAV allowing the AWESOM robot to deploy. It is initially attached to the end of a large roll of PV material, which it unrolls by driving directly away from the MAV, before disconnecting from the end of the roll. The PV blanket provides power to the ISPP system. Additional power may be provided by a PV coating on the MAV’s exterior surface, and/or an ASRG, which can additionally provide heat for the electronics and water tank. Step 2: CO2 is produced by pumping in Martian atmosphere through a dust filter and drying it via zeolite adsorption. The small amount of water captured is stored in the water tank. The gas is pressurised and allowed to cool to ambient Martian temperatures, causing the CO2 to condense, and enabling it to be separated from the remaining gases. Step 3: The AWESOM robot traverses the nearby ground, heating and microwaving the regolith beneath it and collecting the released water. At the end of each sol the robot returns to the MAV to deliver its payload of water by means of a heated hose attached to a robotic arm. The hose nozzle is plugged into a valve in the base of the MAV, and the water is pumped into the MAV’s water tank. The O2 is stored cryogenically as LOX. The Sabatier reaction proceeds at around 600 K in the presence of a catalyst of ruthenium on alumina. This heat could be provided by an RTG, ASRG or an electric heater. H2O produced by the reaction is stored in the water tank, and is used by the electrolysis unit to produce more H2 and O2. The amount of propellant to make depends on the dry mass of the vehicle. Therefore, it’s necessary to make an estimate of this mass. 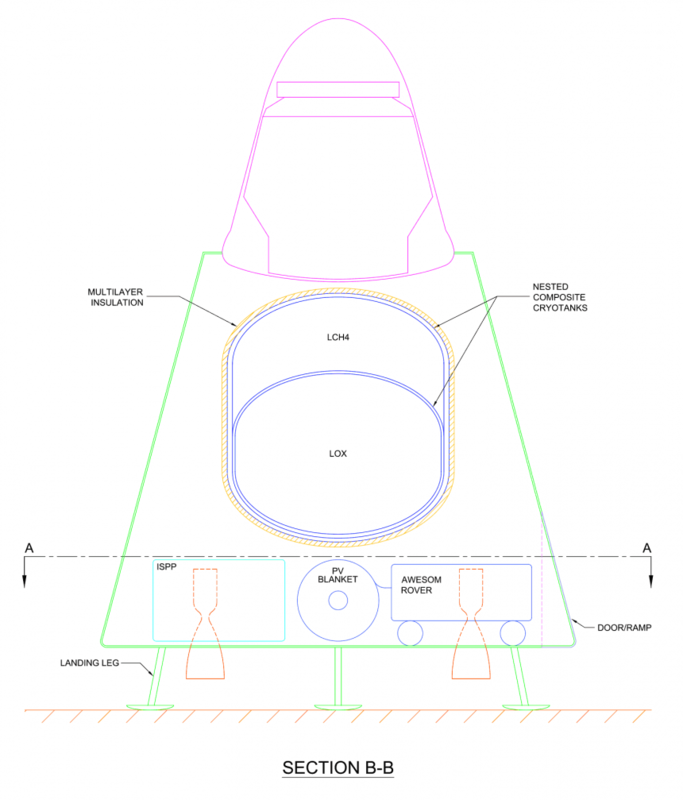 The dry mass of a Dragon V2 capsule is normally 4200 kg. Its heat shield is comprised of 8 cm thick tiles made of a material known as PICA-X (PICA means “Phenolic Impregnated Carbon Ablator”. PICA-X is PICA as made by SpaceX). PICA-X is very light, and the total heat shield mass is only about 230 kg. The landing legs, and SuperDraco engines and associated tankage, are estimated to mass approximately 1 tonne. A modified Dragon without these elements is therefore estimated to mass approximately 3 tonnes. In reality, due to expected improvements in manufacturing and materials, the finished mass will probably be lower. The Dragon capsule can carry up to 1290 kg of propellant for the Draco engines. This is N2O4/MMH (nitrogen tetroxide oxidiser and monomethyl hydrazine propellant), which is storable and non-cryogenic. The mass of the superstructure is crudely estimated from 5 mm thick titanium-carbon composite with a density of about 2800 kg/m2, giving it an approximate mass of 2200 kg. However, this mass could perhaps be reduced using nanostructured materials. The superstructure is also made lighter by the fact that it only needs to stand up in Mars gravity, not Earth’s. Nonetheless, it must still be capable of withstanding the stresses of descent and ascent. The exact mass of tankage will be dependent on the quantity of propellant. Without going into the somewhat convoluted calculations here, the mass of the cryotanks should be about 945 kg. The mass of MLI surrounding the tanks, assumed to be 50 mm thick and having 50 kg/m3 density, is estimated to be 176 kg. The estimated TWR for the new engine is 75. This is higher than TWR of the XR-5M15, which is 71.3, but the proposed engines are larger, and, generally speaking, the larger the engine, the better the TWR. This gives an engine mass of about 120 kg each. The mass of the avionics can be estimated using conventional mass estimating ratios. The payload mass is comprised of six humans (62 kg each) with marssuits (20 kg each) and kit bags (20kg each), plus approximately 300 kg of areological (and hopefully also biological) samples to bring back to Earth. Because this is all very approximate (and possibly optimistic), and to allow for additional items such as fuel lines and coatings, the total is rounded up to 9.5 tonnes for good measure. The ∆v from Mars surface to the 250 km x 1 sol HEMO is 5625 m/s. The stoichiometric ratio for methalox is 1:3.5, therefore, about 7438 kg of CH4 and about 26,034 kg of O2 are required. This quantity of CH4 is about 30% of the quantity in Mars Direct (24 tonnes), and about 110% of the quantity in the DRA (6567 kg). The reason for the higher propellant mass compared with the DRA is the higher wet mass (nearly 43 tonnes compared with 40 tonnes). This is because the MAV in the DRA uses a separate descent and ascent stage, which optimises the ascent mass at the cost of a much higher descent mass. This is a trade off. In Blue Dragon, the price of a common descent/ascent stage (which results in a significantly lower landed mass of the MAV and therefore much simpler and easier EDL) is a slightly heavier ascent vehicle. Even so, with new materials and some clever engineering, it may yet be possible to reduce the wet mass of the MAV to about the same value of 40 tonnes. Mass ratios can be determined from the atomic mass units of the elements. The atomic mass (in unified atomic mass units, or ‘u’) of carbon is approximately 12, hydrogen approximately 1, and oxygen approximately 16. The required quantities of each reactant and product are determined by multiplying each mass in u by a factor of 7438 kg/16 u = 465 kg/u. As only about 26 tonnes of O2 are needed for propellant, the ISPP process will produce a surplus of up to about 3.7 tonnes. 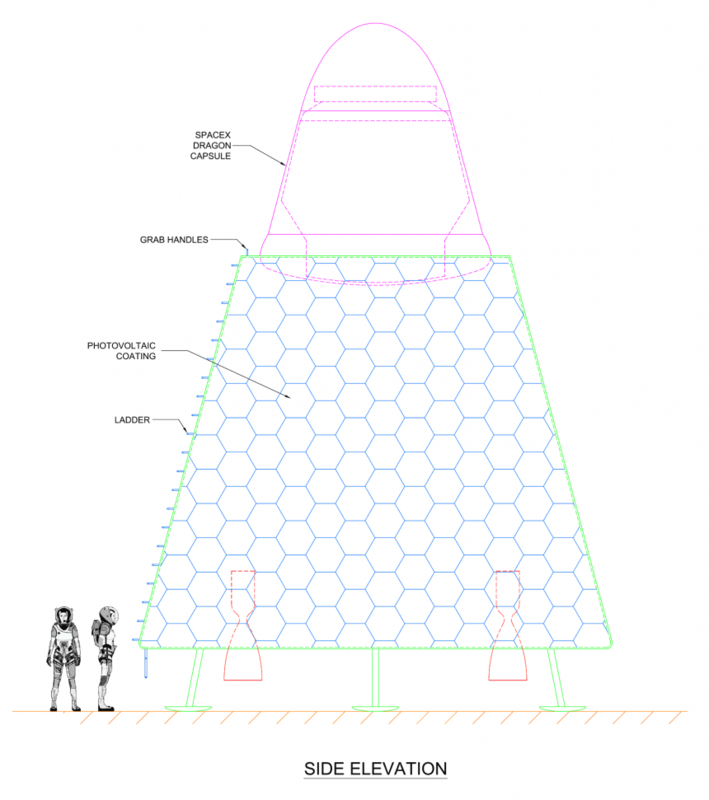 This could be used to supplement air supplies for the SHAB or the CAMPER, or for marssuits; however, the ISAP will also produce a surplus of O2 and will be a more convenient place for replenishing marssuit tanks. In order to minimise tank mass, surplus O2 can safely be released to the atmosphere (thus contributing, in a small way, to terraforming). The Martian atmosphere is approximately 96% CO2, therefore obtaining 20.5 tonnes of CO2 requires processing about 21.4 tonnes of atmosphere. The density of the atmosphere at the surface of Mars is approximately 0.015 kg/m3, so this is about 1.4 cubic kilometres of atmosphere. If the goal is for the MAV to be filled with propellant within 584 sols, which is roughly the time difference between the arrival of the MAV at Mars and the departure of the crew from Earth, this will require processing about 37 kg (2400 m3) of atmosphere per sol. Further analysis is necessary to determine how achievable this is using only solar power. If the pump only has power for half of each sol, on average, it must pump about 200 m3 of atmosphere per hour, which seems pretty ambitious. If the period is extended to 760 sols, which is the approximate time difference between arrival of the MAV and arrival of the crew (depending on the relative trip times), then the processing rate reduces to about 28 kg/sol. In actuality, there are 44 months between the arrival and departure of the MAV. An even slower processing rate is therefore possible, and may be acceptable if necessary. However, sending the crew to Mars without the propellant production completed increases risk. If it isn’t complete when the crew arrive, they won’t be able to move the AWESOM robot, PV material or any ISPP equipment to the SHAB. This is a circle of approximately 26 metres radius. For the MAV to make all its propellant in 584 sols, the AWESOM must collect about 29 kg of water per sol on average, which requires covering about 3.7 m2 of terrain per sol. This should be easily achievable. Because this is a small area, the AWESOM system could be designed to collect somewhat more than this, to allow for variations in water concentration and availability of solar energy, and difficult terrain. A reasonable design goal could be to build the robot to be capable of collecting and carrying up to at least 40-50 kg of water per sol. This will enable the water for ISPP to be collected as early as possible, which is important partly for the peace of mind that will come from knowing the MAV has propellant, but also because H2 is needed before CH4 can be produced. The integrated ISRU system within the MAV, including the ISPP and AWESOM subsystems, is similar to the MARCO POLO mission recently proposed within NASA (Interbartolo et al. 2013). Ongoing design and development of the MAV’s ISPP features would benefit greatly from the research already conducted in the context of MARCO POLO. MARCO POLO is a robotic technology demonstration mission comprised of an octagonal lander and mobile robot, which process Martian soil and atmosphere to produce O2, H2O and CH4. In MARCO POLO, a robot collects dirt and transports it to the lander for water extraction. With AWESOM, the dirt remains in place and water extraction is performed by the robot itself. AWESOM brings the water back to the lander for purification and electrolysis. This is more efficient, and will enable a larger quantity of water to be collected. Most importantly, it enables water to be obtained from permafrost, which would be too difficult to dig up and transport to a lander. MARCO POLO tests closed-loop power production by burning methalox in a fuel cell. In the MAV, the methalox is kept for use as ascent propellant. Power is produced from solar energy and/or an ASRG. The MAV does not include any life detection experiments. At some point after the completion of propellant production and prior to the launch of the MAV, the crew remove the external panels around the base of the MAV, unbolt and extract the ISPP modules, and relocate these, along with the AWESOM rover and PV blanket, to the SHAB. Prior to launch, the areological samples are transferred to Kepler. At departure time, the crew pile into the CAMPER, wearing their marssuits and carrying their kit bags. They drive to the MAV and transfer into Kepler. The CAMPER is then driven back to the SHAB via remote control. The MAV is launched when Adeona is close to periareon. Its propellant tanks are initially filled with about 33.5 tonnes of methalox. The engines propel it upwards from the surface of Mars, with a trajectory curving over until the MAV is flying parallel to the surface of Mars in the same 250 km x 1 sol orbit as Adeona. The local gravity, which the engines must overcome in order to reach orbit. Limits on g-forces that can be withstood by humans. This second factor is checked below. This is slightly less than Earth gravity, although it will be the highest gravity level the crew has experienced for a while. The g-forces will steadily increase as the MAV climbs to orbit and propellant is consumed. Once on orbit, the downward force on the MAV is balanced by the centripetal force produced by its circular path, thus producing zero g-forces in the vertical direction. The axial force, however, will be the full 360 kN produced by the engines. This is an acceptable g-force for trained astronauts. As mentioned earlier, acceleration forces are capped at 4 g’s for crew health and comfort, and so they can reach the controls. Space Shuttle crews, by comparison, experienced a maximum of 3 g; but let’s assume Mars crews are made of tougher stuff. Humans can tolerate 5-6 g for about 10 minutes. Adeona will be in HEMO with periareon at 250 km and a period of 1 sol, inclined at an angle matching the latitude of the IMRS. It will therefore pass directly over the IMRS once per day. The timing and trajectory of the MAV’s launch must be as accurate as possible such that it coincides with Adeona passing overhead, and so the MAV ends up reasonably close to Adeona and on a matching trajectory. Kepler will then separate from the main body of the MAV. 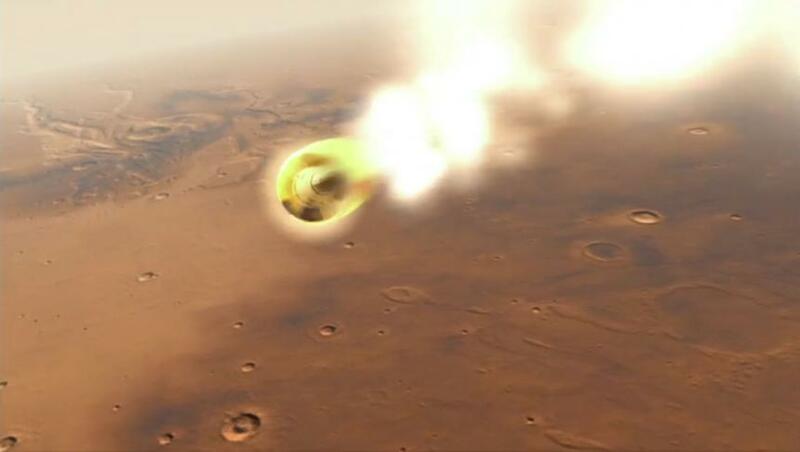 The main body of the MAV will orbit Mars for a while before falling through Mars’s atmosphere back to the surface. Kepler’s nose cap will open, revealing the docking port. Kepler will use its Draco engines to line itself up with the docking port on the end of the THAB, and dock. Once all samples have been transferred from the capsule into the THAB and safely stored, the THAB’s hatch will be closed, and Kepler jettisoned. It will orbit Mars for a while before burning up in its atmosphere. 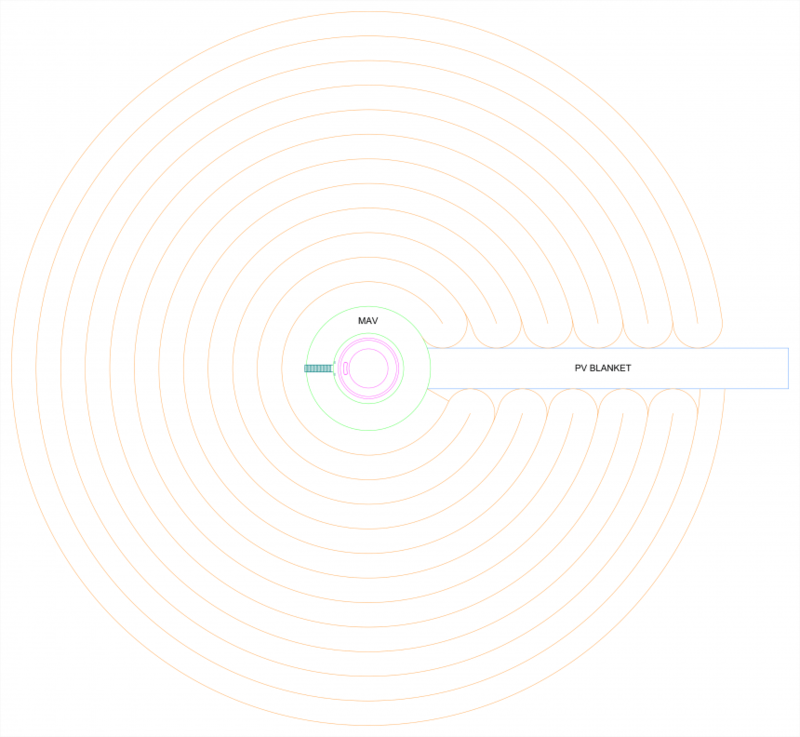 After docking, and before the forward hatch opens, the atmospheres in the THAB and Kepler will be very different. Inside the THAB will be a basically Earthian atmosphere, about 79% N2 and 21% O2 at 101.3 kilopascals pressure and 298 K, as the ECLSS in the THAB will have been remotely activated in advance to warm and freshen the environment. 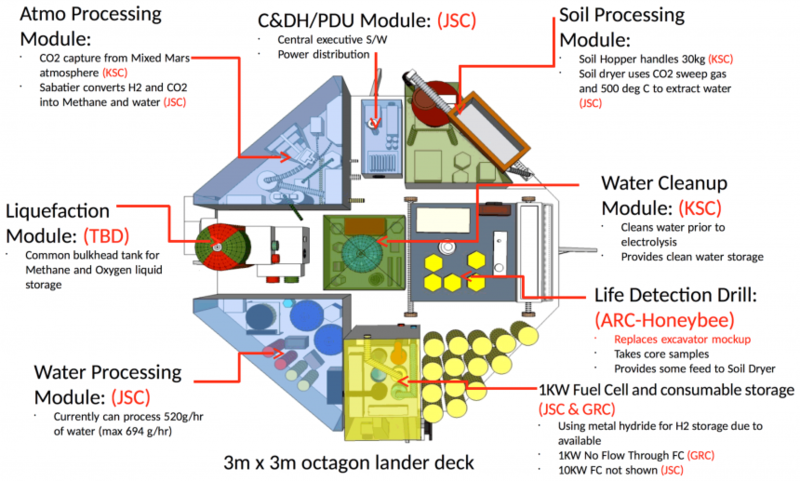 The capsule will still contain Martian air, however: 96% CO2, 2% N2 and 2% Ar at only 600 Pascals. Although this air would have been a chilly 210 K (or thereabouts) at launch, it will have warmed somewhat during the short trip to orbit due to heat from the marssuits and the spacecraft’s systems. If the astronauts open the forward hatch directly, the rapid expansion of air into the capsule could cause injury. Therefore, the forward hatch will be fitted with a release valve that will allow the pressure to equalise gradually. Once the pressure in the capsule has equalised with the pressure in the THAB, it will then be safe for the crew to open the forward hatch and transfer into the THAB, where they can clean any dust off their marssuits and remove and store them. The Martian air from Kepler that will mix with the Earthian atmosphere of the THAB will not pose a toxic hazard. 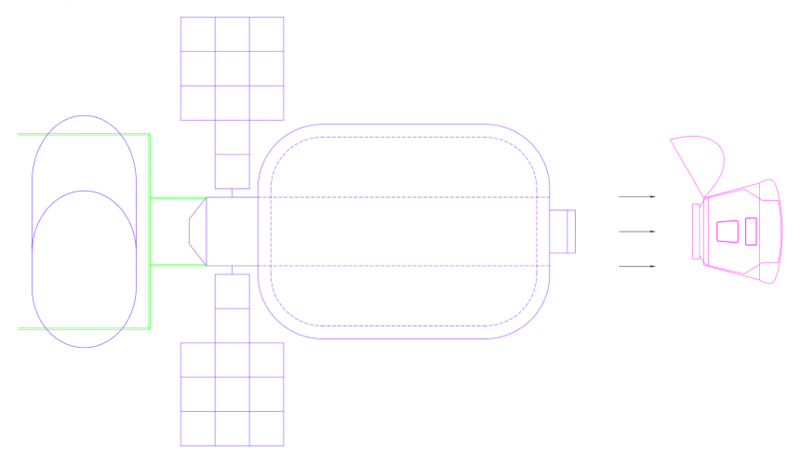 The capsule’s pressurised volume is 10 m3 and the THAB’s is 330 m3; however, the atmospheric pressure in the THAB will be approximately 170 times greater than that in the capsule. The mass of the atmospheric gases in the THAB is approximately 390 kg, but the mass of gases in the capsule is a mere 150 grams. The concentrations of problematic gases such as CO, NO and O3 that will be introduced into the THAB will therefore be very small once distributed throughout the THAB, and the ECLSS will mop them up pretty quickly anyway. The 144 grams of Martian CO2 added to THAB, which will be virtually devoid of CO2 due to having been uninhabited for the past 1.5 years, is less than the usual operating amount of 200 grams. Planetary protection. Kepler has been sitting on Mars for 44 months and could be contaminated with Martian organisms. Although it’s considered unlikely that biological life could survive on the surface of Mars due to the high UV radiation and extreme dryness, there is still a risk that unknown organisms could attach themselves to the capsule, survive the journey to Earth, and enter Earth’s environment. COSPAR (Committee on Space Research) recommendations with regard to planetary protection would therefore be against landing this capsule on Earth. If Kepler is not needed for an Earth landing its mass can be substantially reduced, as no heat shield, thrusters or propellant are required for EDL. This reduces the mass to be landed on, and launched from, Mars, saving considerable expense and difficulty. Without Kepler docked to Adeona, much less propellant is required for TEI. Discarding Kepler incurs an additional expense of launching a Falcon 9 with Newton. However, as these are reusable items, the only cost is for the launch and propellant. A future MAV could perhaps be made fully reusable, with both the lower section and the capsule landing back at the IMRS, where they could be reused, repurposed for storage or shelter, or salvaged for parts. Another approach could be to keep Kepler on orbit for later recovery and reuse as an orbital transfer vehicle. However, this would require a supply of propellant for station-keeping.